I remember regularly passing a sports store in the local city centre back home which amongst other things sold baseball bats even though we don't play baseball in the UK. Maybe cricket bats just aren't as intimidating. 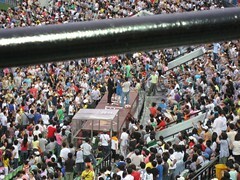 When I studied the Japanese language, I inevitably picked up on many aspects of the culture, including baseball, where the crowds are wild. 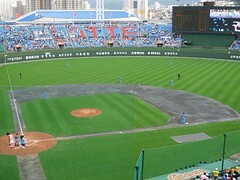 Baseball is also big in South Korea, so when I came to Busan, one of the things I wanted to do here, was to experience a game, even though I was warned that the local team wasn't very good. 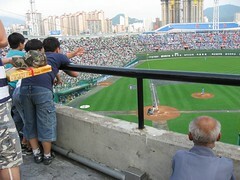 In Korea, baseball teams are a corporate affair. 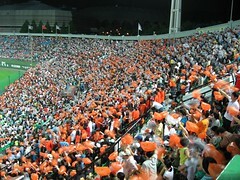 The local team is called the Lotte Giants, but this doesn't merely point to a sponsorship deal by Japanese corporate Lotte - they founded and own the team which forms part of the empire which also brings us the fifties-retro McDonalds-type fast-food franchise Lotteria, Lotte Mart supermarkets, Lotte Department Store, Lotte Card, Lotte Capital, Lotte Hotel, Lotte Electronics, Lotte Machinery... well, you get the picture. Lotte is an interesting company because it's so much a part of the landscape here I get the impression most Koreans think it is actually Korean, but while it was founded by a Korean in 1948 it very much remains a Japanese company. Whether it would be quite so successful here were the reality known is a question which has been on my mind for some time. 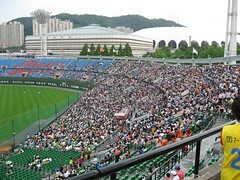 The Giants sometimes play at a smaller stadium in Busan, but the game we were going to see was against the Samsung Lions from Daegu - no prizes for guessing who owns them (the six other teams in Korea are similarly corporate affairs). 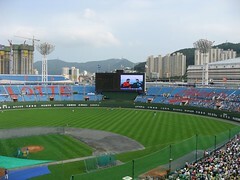 It was expected to be a big game so it was being held at Sajik Baseball Stadium in the former city of Dongnae, which has since been absorbed by Busan and is now very much part of the greater metropolis. Despite getting there at four in the afternoon - an hour before the game started, our side of the stadium (which seats over 30,000) was already quite full. It turned out there was some kind of special deal today, so three of us got in for the almost unbelievable price of 6,000 won (about £3.23). The inflatables we bought to bang together cost 2,000 per pair - although sometimes they give them away. Today they were giving away pom-pons made of newspaper cuttings. The players warmed up on the pitch, which was then watered and painted while in the outfield a children's ball collection contest unfolded. As five o'clock approached, officials started to whip up the crowd and the noise level, which was never low to start with, began to rise. 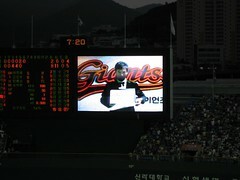 At two minutes to the hour, the national anthem was played (which turned out not to be 안돼 안돼 - who knew?) and the crowd rose to their feet while the players stood to attention down on the pitch. The game got under way and below us drums began to bang (sadly there are no trumpet players as there are in Japan though), but the crowds kept on coming. In fact, it was about forty minutes before there was any noticeable easing off in the number of people streaming by in front of us as they vainly looked for seats in the best sections of the stadium. So what had looked like a reasonably good spot at the front of one of the raised sections rapidly transpired to be a rather annoying one. In fact, as the game progressed it became apparent that a sizeable number of the crowd had actually come to play musical chairs rather than watch the game. Irritatingly, a surprising number of people seemed to think nothing of parking themselves on the balconies in front of seated spectators, so my companions regularly demanded that they move, which fortunately they did. Sometimes a heavily set man from somewhere above us came down and quickly persuaded any obstructions to move, but despite the encouragement I passed on my chance to admonish the locals - I figured getting ticked off by a foreigner doesn't do much for our lot here in Korea; judging by the newspapers there are enough people who don't like us anyway without adding fuel to the fire. On the other hand, I just blanked the youths who insisted on passing by saying "Hey Man!" to me in their best Korean-American accents. One of the less annoying intrusions was this very old man who squatted himself down at the edge of the balcony, until a food vendor ran into him and got him to go to a seat, and one of the more alarming was the sight of very young children who, whilst there parents were presumably somewhere far away eating pizza and drinking beer, hung over and under the bar at sometimes alarming angles - it's a long way down on the other side. Part of the reason for the constant shifting around was food related. 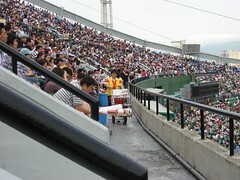 Vendors rolled their carts up and down selling popular local snacks such as dried squid, and of course, Hite beer. In fact, the smell of food mixed with alcohol was fairly constant throughout the game on the breeze of an unusually cool summer evening which blew through the stadium. Many had brought their own food though, and we're not talking mere snacks here; carefully balanced steaming pizza boxes regularly passed tantalisingly close by eyes mocking me as to why I hadn't thought of that. It also seemed that ordering a pizza delivery to the stadium was not unheard of. 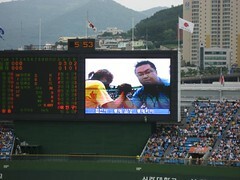 During one of the regular intervals there were arm-wrestling contest, but more unusually, there was a marriage proposal by someone who, accompanied by a pop song, revealed his message on a series of cards on the big video screen. As the object of his affections was brought onto the stage and thousands of people stared right at them, there were some tense moments as one of the presenters willed the woman towards the proposer, but it all just about seemed to work out in the end. When a man in a Giants' tracksuit and a dubious pair of white boots wasn't on the stage, the Giants' cheerleaders entertained, but in the distance another crowd-embedded stage played host to a different set of girls, perhaps representing the Lions, and if a rather suggestive can-can weren't enough, they appeared to have left rather more of their clothing in the dressing room. It also seems to be tradition here that if they pick out you and your partner during the 'kissing interval' - you're supposed to do so, but we didn't find ourselves up on the big display in the end. The Giants took four runs each in the third and fourth innings to take a commanding 8-0 lead, which only spurred the crowd on to greater heights of noise creation. But men - one inexplicably with a pan on his head - still worked their way through the various sections encouraging the crowd even further. 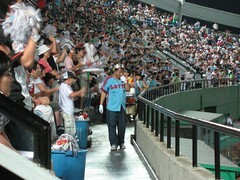 The noise never let up even when play was on, except for the occasions when Lotte were pitching. When balls flew into the crowd and were caught chants of "give it to the child" began, as women with children rushed towards the catcher. Every time the Lions attempted a pickoff move even louder chants of "leave him alone" echoed around. 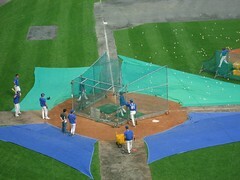 Apparently, rival teams find this stadium particularly intimidating to play in. Towards the end, orange bags were handed out - presumably for rubbish collection - but they promptly became hats turning the crowd into an even more animated sea of orange. 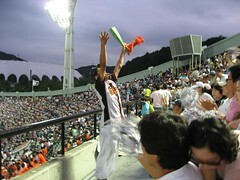 With Busan's victory seemingly assured we left in the early part of the ninth innings - our driver wanted to get away before the chaos began and even though I would have loved to stay I can't say I blame her - the traffic here is bad enough without adding a pumped-up alcohol-fuelled baseball crowd to it. 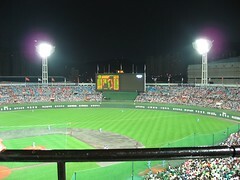 We'd been at the stadium for almost four-and-a-half hours and we'd watched daytime turn into dusk and then into night. After so many humid days it was great to be out in the cool breeze, and the other kind of atmosphere - that of the crowd, was certainly an experience. 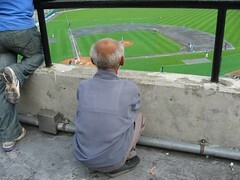 I went into the stadium curious and left a baseball fan. 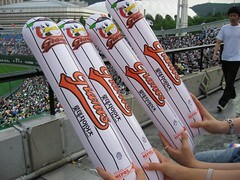 The Giants won the game 9-3. As we drove away I noticed there was a Samsung Tesco practically next door to the stadium - they must have their work cut out. Meanwhile, back home and a world away, two would-be suicide bombers were on their way to try and kill people at an airport. I'm glad you clarified that baseball isn't played in the UK, thus explaining your unfamiliarity with the ubiquitous "kiss cam," a staple at most US sporting events. Not sure where this tradition started, but I doubt it was in Korea! I read your blog to learn more about Korea, but this post taught me about Brittain instead. Cheers, I had no idea about kiss cams - I don't think we have this at all in the UK.